Navratri 2016: When Does The Hindu ‘Nine Nights’ Festival Begin? “Navratri” — the 9-day long festival dedicated to the Hindu goddess Durga — begins Saturday, Oct. 1, this year. According to Hindu mythology, goddess Durga, a symbol of motherhood, power and courage, defeated the demon Mahishasura in a battle that lasted nine nights. During Navratri, Hindus celebrate the triumph of good over evil with festivities that is conducted through ritualistic chanting, prayers and fasting. On each day of Navratri, one form of Goddess Durga is worshipped, and the rituals end on the tenth day with the immersion of the idols in water bodies. 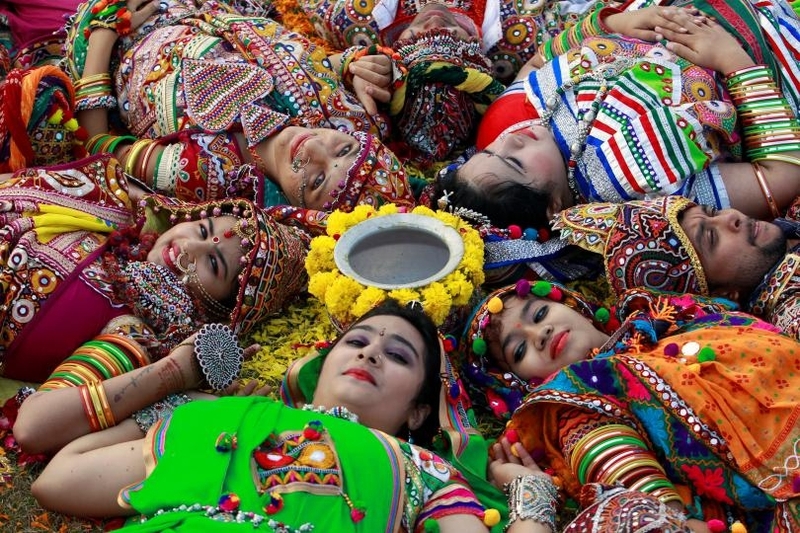 Navratri, which literally means “nine nights,” is not always nine days in length. This year, for the first time since 2000, it will last for 10 days due to the first day of Navratri being spread over two days due to the lunar calendar. Navratri will end this year on Oct. 10 and will be followed by the festival of Dussehra, which is celebrated on the 10th day of the month known as Ashwin in the Hindu calendar. In India, Navratri festivities comprise of worshipping goddess Durga’s nine forms, that is also marked with traditional dance and music. Farmers sow their seeds during this time to seek the blessings of Durga, who is also associated with the fertility of earth. The time of Navratri is meant for introspection and purification. Day 1: Shailaputri, known as the daughter of the Himalayas. Day 2: Brahmacharini, symbolizing a female who pursues sacred religious knowledge. Day 3: Chandraghanta, which means the one who has a half-moon shaped bell. Day 4: Kushmanda, the creator of the universe, is believed to help improve health and bestow wealth and strength. Day 5: Skandamata — a symbol of motherhood. Day 6: Katyayani — named after the sage Katya, in whose house goddess Durga is believed to have taken birth in one form. Day 7: Kalaratri, regarded as one of the many destructive forms of Durga. Day 8: Mahagauri, the wife of Lord Shiva. Day 9: Siddhidatri, known as the provider of supernatural powers.